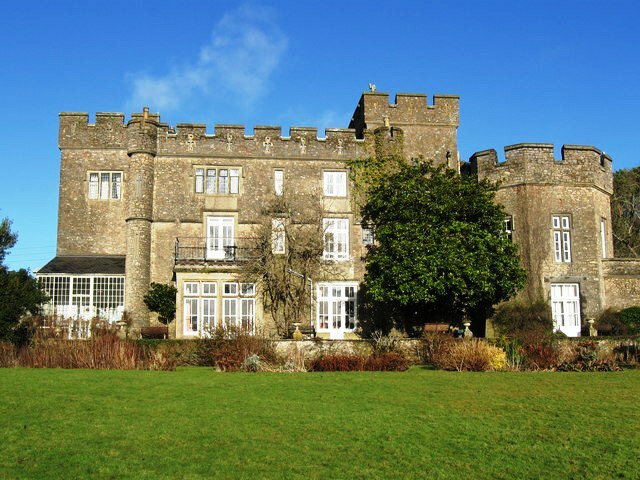 Notes: Banwell Castle is a Victorian Gothic Revival mansion in Banwell, Somerset, England. It is a Grade II* listed building. The castle buildings, now a hotel and restaurant, and sometimes used as a wedding venue, are set in 25 acres (10 ha) of grounds which are used for hawking activities. The land on which the house is built was owned by the Bishop of Bath and Wells. It was sold to John and Joan Landown in 1753. It was passed down to the Sympson family; John Dyer Sympson, a solicitor from London built the castle as his home. It was completed in 1847 to a design by Augustus Pugin. Having passed to Sir William Baker, it was expanded and embellished in the 1880s by Sir Elskin Baker. The castle was bought and sold many times in the subsequent 100 years. In World War II it was taken over by the Royal Air Force and used as the headquarters for No. 955 Squadron, which was a barrage balloon unit and part of Balloon Command. The gatehouse was used by the local Air Raid Precautions. In 1956 the estate was sold to Simon and Phillipa Wills (of W.D. & H.O. Wills). Until 1988 the owners were Charles Skilton, a book and postcard publisher, and Jean Desebrock from South Africa. They sold it to William and Hugh Parsons who converted it into a hotel and restaurant.